On the heels of their years-long success of infectious disease spreading simulator Plague Inc. ($0.99), developer Ndemic Creations released a follow-up title in a similar vein this past December called Rebel Inc. ($1.99). It utilized a similar overworld viewpoint but instead of trying various strategies to spread diseases across the globe you were instead trying to stabilize a post-war country which required you to “balance military and civilian priorities to win the hearts and minds of the people, whilst also stopping insurgents from seizing power!" 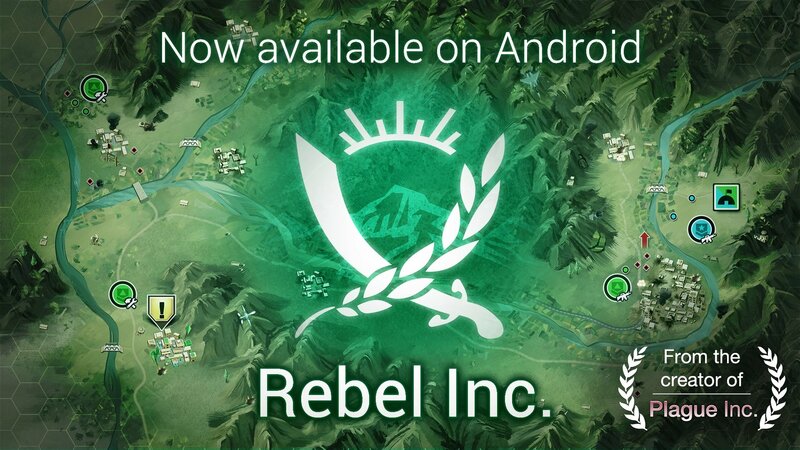 While that release in December was for the iOS platform only, Ndemic has recently released Rebel Inc. on the Google Play Store so Android folks can get in on this political/military simulation. When we first found out about Rebel Inc. late last year, I wondered if Ndemic Creations would be able to replicate the type of success they’d had with Plague Inc. and if the whole thing wasn’t just a military re-skin of a proven formula. Well, to their credit they’ve been able to craft an experience that feels familiar and entirely new at the same time, and provides a nice complement to the wonderful Plague Inc. Gamers seem to think so too as Rebel Inc. has, much like its predecessor, dominated the top of the iOS charts since its release. It’s great that Android players can now experience this for themselves.